This photograph of the Silas Mainord home was made around 1912 or 13. Carlos Mainord, grandson of Silas Mainord, son of Silas Dennis Mainord, is holding his first born son, Yelton D. Maynard. Mary Elizabeth Stover Mainord (known as Dolly) stands next to him. The second wife of Silas Dennis Mainord, Nancy, is dressed in black. Photo courtsey of Gerald Maynard. 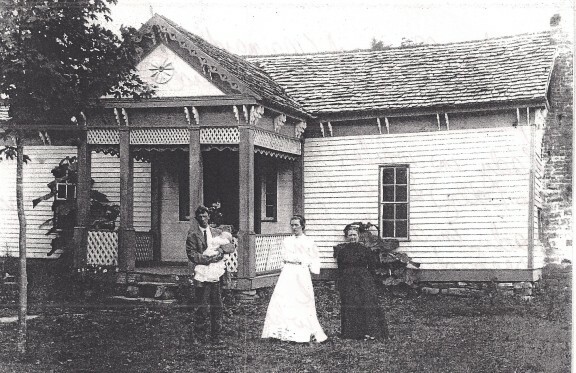 The last name "Mainard," "Mainord," "Maynord," or "Maynard," all pronounced the same way, but obviously spelled differently, is one that goes back to the early history of Overton County. With the help of James Hunter, a former resident of Livingston, along with Gerald Maynard of Livingston, and in doing research on Ancestry.com, here is some information about one of families whose last name was spelled "Mainord" or possibly "Mainard" back in the 1700's. According to James Hunter, the name "Mainard" started when people from the Province of Maine in Normandy went with William the Conqueror when he invaded England in the year 1066. Following that invasion, William the Conqueror required all families to have a surname for identification purposes. Evidently, those people from the Province of Maine wanted to be identified with the place where they originated, and thus the name "Mainard" began. It was in the year 1788 that Silas Mainord, son of William and Agatha Mainord, was born in Wake County, North Carolina. On January 21, 1811, he and Tabatha Marcum, who was born in the year 1793, were married in North Carolina. I don’t have information as to how and when they arrived in Overton County. According to James Hunter, the Mainord couple lived in a house in the Fellowship community that is still partially standing. I don’t know if religion played a part in the lives of Silas and Tabatha, but one thing is for sure. They certainly did their part to follow one particular scripture that says "Be fruitful and multiply..." They were the parents of twenty-three children. James Hunter heard it was told Tabatha wanted an even two dozen, but when the doctor told her after having twenty-three, she didn’t need to have any more children, she cried. Those tvs shows today about couples with large numbers of children would have loved her! There were only 19 names of the children listed on Ancestry.com and they include the following: Frances; Sarah; Brinkley; Samuel; Syreana; Nancy Jane; William M.; Wesley; Gabriel; Elizabeth; Louis Colman; Levi; Mary Helen; Silas Dennis; Eli George; Tabitha; Delilia; Lydia; and John. A story James Hunter also heard about the Mainord children was that during the summer months, they would often go off and play in the nearby fields of grass and high weeds. When it came time for them to come home, their father, Silas, would ride a mule and follow the trail of broken down weeds to find them. He would pick up the children one at a time, put them on the mule’s back until he got a load, take them to the house, then go back and get another load until they were all picked up and brought home. When Silas’s wife, Tabatha, died, he married her sister, Delila Marcum Roberts, a widow, but no children were born of this marriage. Before the start of the Civil War, the Mainord family made quite a few enemies when they openly expressed the fact they were opposed to secession. The story was told that one of Silas’ sons once made a speech in Livingston against secession and was run out of town by a mob. He then went to Jamestown and made the same speech, but was welcomed with open arms in that town. The incident involving the making of a speech against secession was later known in history as "The Mainord Affair." And in spite of the fact that the Mainord boys did not believe in secession, they joined the Confederate Army and served throughout the war. Some of the enemies they made before the war because of their stand against secession continued to hold that against the Mainord boys and tried to prevent them from getting a Confederate Veterans pension. This was done in spite of the fact that the disabilities the Mainord brothers suffered were brought on as a result of the war. Syreana Mainord, one of the daughters of Silas and Tabatha, married Allen Brock Hull whose date of birth was August 17, 1811. Syreana and Allen Brock Hull also had a large family. The names of 17 children are listed on Ancestry.com as follows: Tabetha Jane; William Pascal; Mary Elizabeth; Nathaniel Riley; Silas; Franklin Dennis; Qui C.; Levi Calvin; G. Kimber; Kimberly; Gabriel; Enoch Stanley; Lewis Alford; John Robert; Delilah Helen; and Anderson Young. Syreana and Allen Brock’s son, William Pascal, married Elizabeth Riley, and they were the parents of a son whose name most everyone in this area recognizes. It is none other than Cordell Hull. Including that famous son, William Pascal and Elizabeth Hull had a total of five children. Some most unusual names were chosen for at least two of their children. The oldest was named Orestes Ress Hull. The second one was Senadus Selwin Nade Hull; Cordell was their third child. The fourth was named Wyoming Hull, and by the time the fifth came along, someone’s creative juices as far as choosing unusual names goes must have ceased to flow. This son was given the rather ordinary name of Roy Hull. Tabatha died in 1847, some 14 years prior to Silas Mainord’s death in March of 1861. She is buried in a cemetery some refer to as the Needham cemetery and others know as the Parker cemetery near Irons Creek in Clay County. I was not able to determine where the final resting place for Silas is. The property on which Silas Mainord built the old original home was purchased in 1839 and has been in the Maynard family ever since. It is owned today by his great-great grandson, Gerald Maynard and wife Reba (Gunnels) Maynard.